Courtesy of Berkshire Hathaway HomeService, Marco Rufo. This property has approved plans (RTI) for a 12,000 sqft., modern with massive ocean views. Current home is a serene ranch style home hidden on a private road of lower Mandeville Canyon. 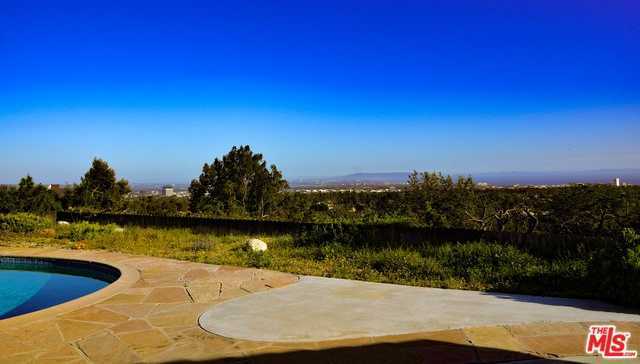 This tranquil property with an extra-large lot offers breathtaking views from the ocean to downtown Los Angeles. It has 3 bedrooms, 3 bathrooms with great sun exposure. The gourmet kitchen was newly renovated with Miele and Subzero appliances. The master retreat has its own private sitting room/office. This entertainer’s home has a great open floor plan that opens to the beautiful yard that has a great swimmer’s pool.